For other uses, see Pot luck (disambiguation). A potluck is a communal gathering where each guest or group contributes a different, often homemade dish of food to be shared. Other names for a "potluck" include: potluck dinner, spread, Jacob's join, Jacob's supper, faith supper, covered-dish-supper, dish party, bring-and-share, shared lunch, pitch-in, bring-a-plate, dish-to-pass, fuddle, fellowship meal, and carry-in. While there exists some disagreement as to its origin, two principal theories exist: the combination of the English "pot" and "luck" or the North American indigenous communal meal potlatch. The word pot-luck appears in the 16th century English work of Thomas Nashe, and used to mean "food provided for an unexpected or uninvited guest, the luck of the pot. "[This quote needs a citation] The modern execution of a "communal meal, where guests bring their own food," most likely originated in the 1930s during the Depression . The alternative origin of the word is associated with a tradition common to the Tlingit and other indigenous peoples of the Pacific Northwest, called a potlatch, and is considered by proponents of this theory to be an eggcorn or malapropism. Potluck dinners are events where the attendees bring a dish to a meal. Potluck dinners are often organized by religious or community groups, since they simplify the meal planning and distribute the costs among the participants. Smaller, more informal get-togethers with distributed food preparation may also be called potlucks. The only traditional rule is that each dish be large enough to be shared among a good portion (but not necessarily all) of the anticipated guests. In some cases each participant agrees ahead of time to bring a single course, and the result is a multi-course meal. Guests may bring in any form of food, ranging from the main course to desserts. 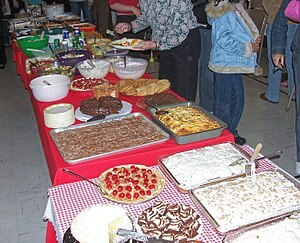 In the United States, potlucks are associated with crockpot dishes, casseroles (often called hot dishes in the upper Midwest), dessert bars, and jello salads. Traditionally, potlucks were a simple combination of dishes brought together by event attendees without a general theme. Recent times have seen the growth of themed dinners for parties or special occasions. ^ Partridge, Eric and Paul Beale. A Dictionary of Slang and Unconventional English, 8th ed. (1984). ^ Bachelor, Lisa (October 4, 2002). "Surviving on a student budget". The Guardian. ^ Flora, Martin. "Potluck Meal Innovation Due to Depression: Guests Chip in With Part of Dinner", Chicago Tribune, Chicago, 27 January 1933. Retrieved on 5 March 2017. Wikimedia Commons has media related to Potluck. Look up potluck in Wiktionary, the free dictionary. What's the origin of "potluck"?